With Gilbert, as ever, the objective and personal symbolism was forever fused. Icarus is not just the classical character, he is also the ambitious artist, struggling against material limitations, longing for spiritual freedom, an exhibitionist keen to perform something outstanding in public and be admired for it (Dorment, pp. 46,49). Comedy and Tragedy: "Sic Vita" is ostensibly a stage prop-boy running with the mask of Comedy in his hands at the moment he is stung by a bee. But it can also be seen as a commentary on Gilbert's life: the supremely successful triumphant artist and social figure best by debt, troublesome patrons and family problems (Gilbert, 116). The Broken Shrine is the least objective in its symbolism — it refers almost directly to Gilbert's feeling that the beauty he had hoped to create had been despised and rejected; he was on the verge of bankruptcy, weighted down by defeat and despair. (Gilbert, 184). 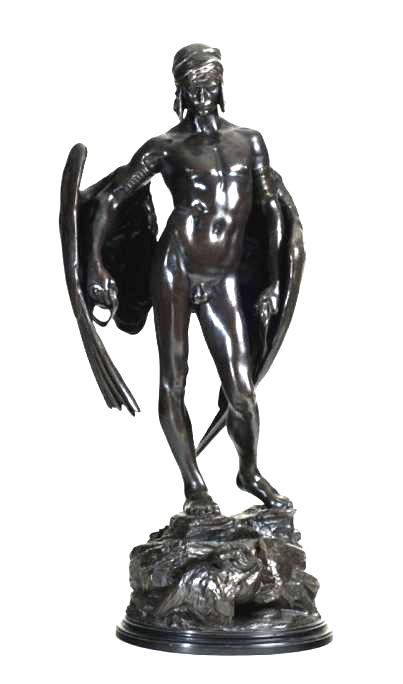 The Classical base-myth of Gilbert's Icarus is symptomatic of a wider use of this subject area. Between 1884 and 1892 Harry Bates sent six classical subjects the Royal Academy involving Socrates, Aeneas, Psyche, Pandora and Endymion. Pegram, seen as to some extent in debt to Gilbert in the 1880s (Art Journal : 281) exhibited a constant stream of classical works, often with deeper, symbolist implications: Sibylla Fatidica (1891), Pan (1904), Perseus delivering Andromeda (1907) down to Salmacis as late as 1935. 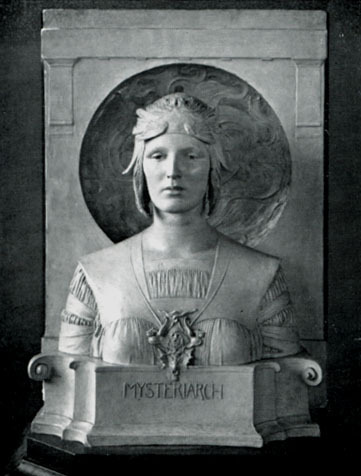 Pegram had also though worked for Thornycroft, sculptor of Artemis (1880), Teucer (1881) and Medea (1888), and Gosse indeed saw Thornycroft as translating "into exact and modern language such ideas of beauty as are most analogous to the best Greek feeling". (Magazine of Art : 329). One can in fact identify many of the afore mentioned constituent streams of the New Sculpture — even some ostensibly opposed — in a single work by Thornycroft, his masterpiece The Mower of 1884. It took its origin from a piece of naturalistic, real-life observation in 1882, when Thornycroft was cruising on the river Thames and made a drawing of a mower he spotted resting on the banks as he passed by. He then made study drawings for the figure from a model (Orazio Cervi) in the studio. Here the natural basis is being worked up, a process of idealising the observation of nature that is a regular feature of formal art and comparable in principle with the practice of such arch neo-classicists of a previous generation as John Gibson. There followed small sketch models in wax and plaster (later to be cast in bronze and marketed), testing the three-dimensional potential of the idea: the most obvious variation is scythe-down (as observed) or scythe-up. The final statue was exhibited (in plaster) at the Royal Academy in 1884. It was accompanied in the catalogue by three lines from Matthew Arnold's poem "Thyrsis," setting loose a series of full classical reverberations. Arnold's poem took the apparent form of a traditional conventional classical elegy, to his friend the poet Arthur Hugh Clough, complete with classical title. Yet within this ostensible classical framework the poet makes a rich vehicle for natural description. There can be no doubt that Thornycroft is indicating a parallel here for the Mower. 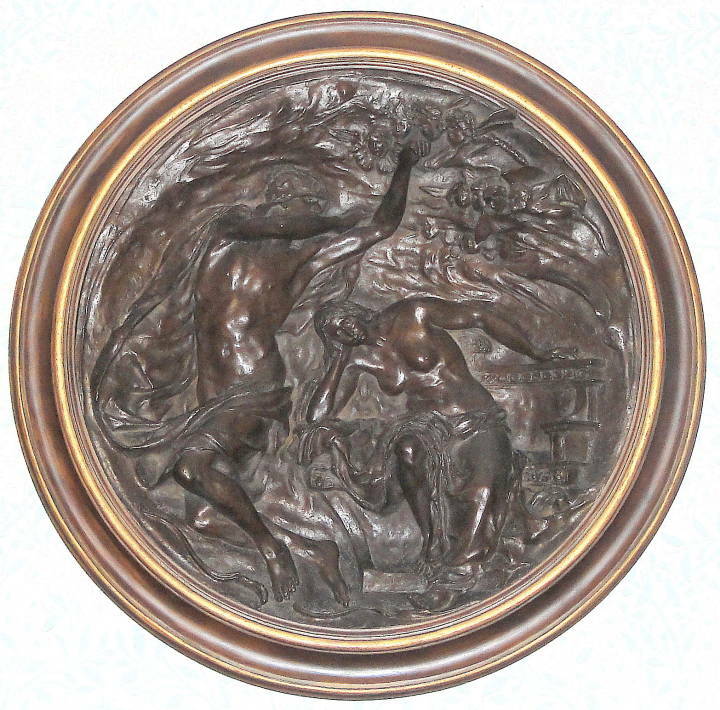 Not only that, we know the sculptor greatly admired the work of painters such as Fred Walker and George Mason, who had in recent years been evolving a genre of classicised poetic naturalism — Walker's The Bathers of 1867 mingles a relentless observation of nature (as we know from his letters [Letters, pp. 72-77]) with a frieze-like arrangement of figures and drapery based on the Elgin Marbles, while Mason's The Harvest Moon shown at the Royal Academy of 1872 has rural figures — including two mowers and with their scythes up — clad in Phidian folds; Thornycroft noted in his diary for 1872 that this latter was a "most perfect work" (1872 Diary p 67). There are still further reverberations here: to G.F. Watts, attempting from the later 1860s to adorn mythical and literary proto-symbolism with Greek fifth-century drapery in both paintings and, most notably, his sculpture Clytie of 1868; and not least to Frederic Leighton, the supporter and cajoler of so much that was new in painting and sculpture from the time of his election to full Academician status in 1868, the same Leighton who is his own work attempted to blend an ideal of the classical and the Renaissance that was based on painstaking natural observation. Afred Gilbert. Exhibition catalogue. London: Royal Academy, 1986, pl 29. Dorment, Richard. Afred Gilbert. New Haven and London: 1985. Marks, J.G. . Life and Letters of Frederick Walker, ARA . London: 1896. 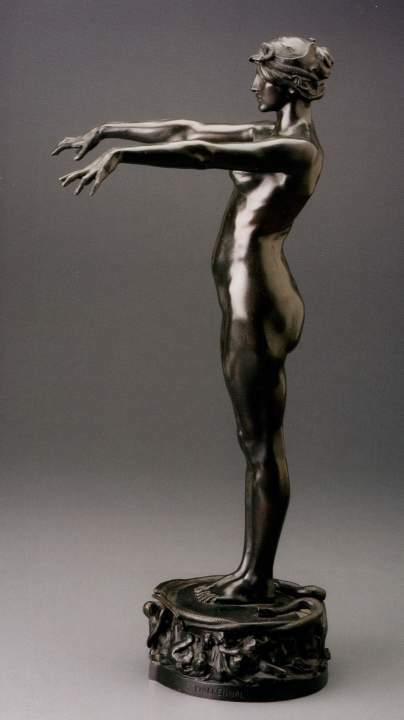 Thornycroft, William Hamo. 1872 Diary; coll. Henry Moore Centre for the Study of Sculpture, Leeds.